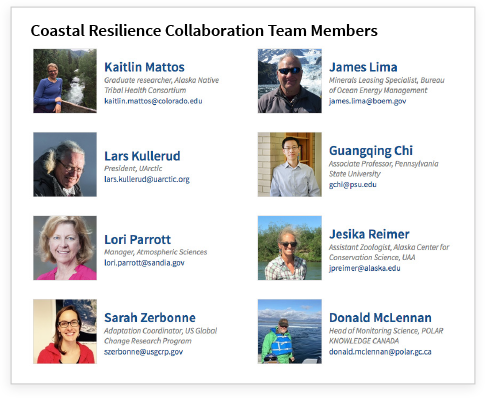 The IARPC (Interagency Arctic Research Policy Committee) Collaborations website brings together scientists from Federal, State, academic, NGO, industry, indigenous and international organizations to share their work and team up to solve hard problems. 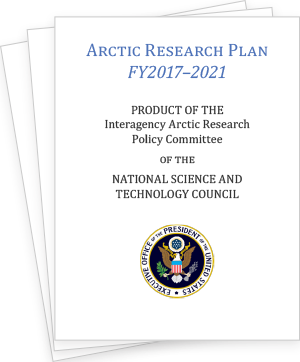 Published by the Executive Office of the President, the Arctic Research Plan 2017–2021 (“the Plan”) intentionally builds on the strong intellectual accomplishments and ideas of researchers at the Federal, State, local, and tribal levels as well as inclusion of ideas from the academic community, non-governmental organizations, and industry. By participating in a Collaboration Team, you can contribute to implementing this Plan. Every team meeting includes an opportunity to share your work with potential new collaborators. 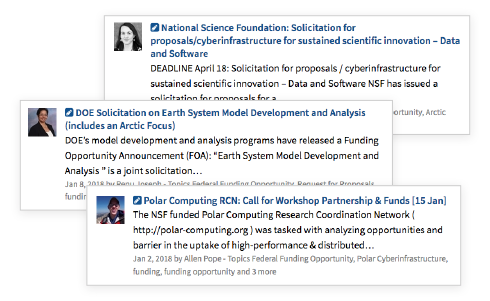 Find synergies and build partnerships with your colleagues in Federal agencies, academia, NGOs, industry, indigenous, and international organizations. 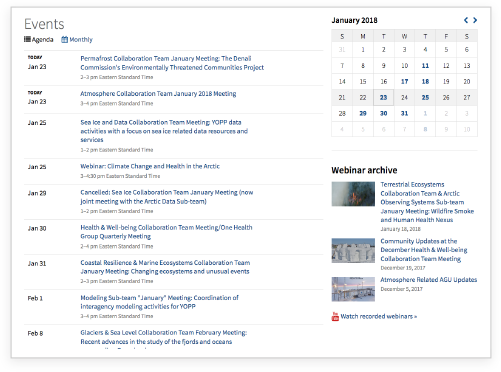 Use the team pages to learn about ongoing activities and opportunities, important meetings, or post something there yourself. 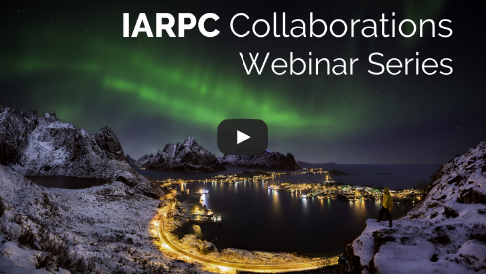 We invite posts with information that will benefit the IARPC Collaborations community including announcements, recent findings or publications, requests for collaboration or input, upcoming events, or new resources. 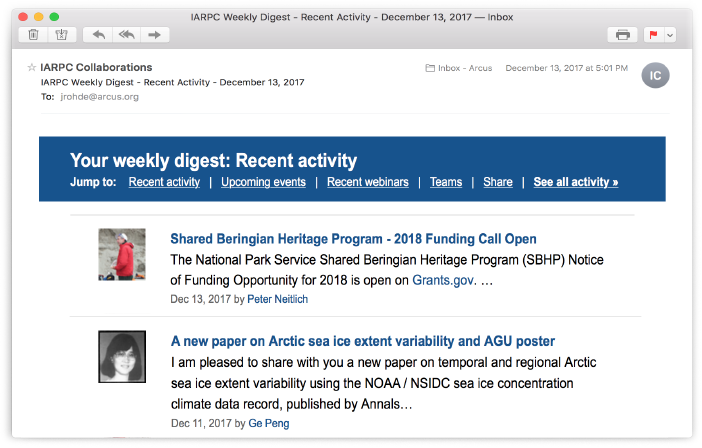 Make a post on the member space and it will be included in our weekly email digest, personalized to each individual’s interests, and delivered to the inbox of the over 2,000 members of IARPC Collaborations. Federal and Non-Federal Program Managers from various agencies and organizations lead our collaboration teams and post new opportunities to the member space regularly. 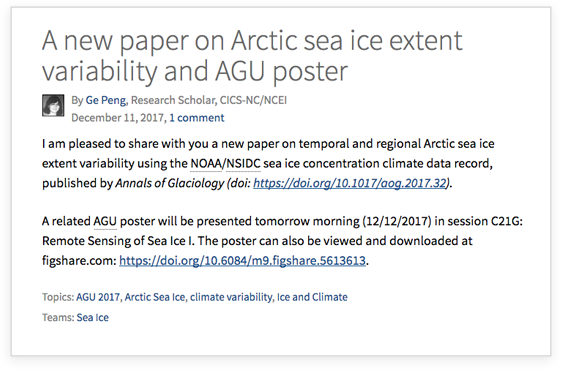 Learn about cutting edge Arctic research both live during our team meetings or later posted on our website. All the info you need for upcoming and past meetings, events, and conferences in one place. Look for upcoming events or find meeting notes and presentations from events you attended or missed. Join IAPRC Collaborations to contribute your work to our reporting. Biennial reports to congress capture the highlights of these activities. Your work might be included! 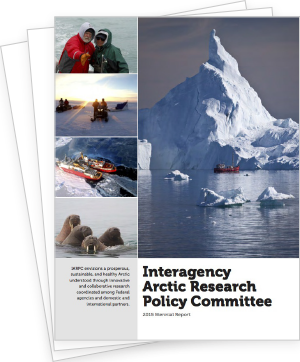 IARPC’s Arctic research plan is supported by Collaboration Teams including Federal and non-Federal partners.